For the latter I’m sure they mean “how to you summon up so much awesomeness to run without all the hype of an actual race day” and not “why bother .. ” because quite frankly I’m sure I don’t know people who think like that – most of my circle run just for the fun of it (weird right), I on the other hand quite like a reward for my efforts and muffins don’t always cut it ..
Well they do, but what’s the harm in having both once in awhile. There is only one person I like to run with and that’s James, although that wasn’t always the case. He used to be all excitable and energetic (somewhat like a cheerleader sans pom poms) and would encourage me to try and run faster or further – which I just found to be annoying as f**k. Now that he’s resigned himself to the fact that his wife is quite content with her mediocrity, he’s much nicer to run with and (bonus) he’ll pull me up the hills. He might tell me that I’m soft, but he’ll do it nevertheless. So it kind of goes without saying that I’m a fan of virtual racing and I think more people should get into it, especially those of you who need a “push out the door” when it comes to running. No cueing for the toilet, no jostling for space, nobody cutting in front of you (and then abruptly stopping). It’s just you and whomever you have decided you want to freely share your time and trail with. You can run it on any day at any time that suits you and if you don’t want to run hills (and honestly – who does), you don’t have too because you are the Race Director! It costs less to run virtual race than an actual one especially if you’re interested in the longer distance events, even if you factor in the fluctuating FX rates (as the majority of virtual races are based oversea). This is generally due to the fact that there are much lower overheads for virtual race organisers. Virtual races are held year round, whereas I’ve found that the races who offer medals in NZ are generally only held in the summer months. There is no Race Director to map out a course or volunteers to smile and point the way. There are no water stations, port a loos or ambulance staff on stand by. Most (but not all) virtual races work on an honor system, you pay for the medal and it’s mailed to you. There is no finish line to cross before you are given it, so if you were “that way” inclined you wouldn’t have to earn it, if you didn’t want too – I’m sure this isn’t relevant to any of my peeps BUT if you don’t trust yourself you could choose to sign up for the events that require proof (from your Garmin or other running app) that you’ve completed the distance before the race director will release your medal. Which brings me to .. The time between the suggested virtual race day and when you receive your medal in the post is ages (think weeks not days) so it’s definitely not like an actual race day when you are handed your medal immediately upon crossing the line. I negate that time lag by not running the distance until AFTER I’ve received the medal, which is how I am able to get those medal holding “race day photos”, obviously I can only do that because Hogwarts Running Club (who’s virtual races I support) work on a honor system, I don’t have to supply proof prior to the medal being shipped. 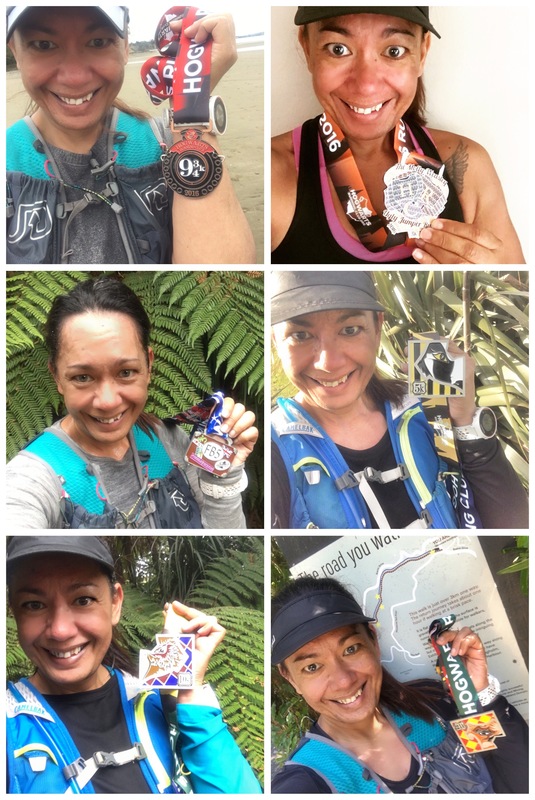 If you are wondering, most virtual races do include race bibs, but I don’t wear one when I run a virtual race because quite frankly I’d feel like a knob and that’s saying something when I’ll happily pull my medal out of my hydration vest and take a myriad of selfies with it, regardless of who happens to be around so if race bibs are your thing then don’t discount virtual races based on that fact that none of my race photos shows me wearing one. Although there are a myriad of groups who organise virtual races I can only vouch for one personally and that is Hogwarts Running Club, they also have a fund (The Luna Fund) where people who can’t afford to participate can request to be sponsored. Someone (it’s all anonymous so I’m not sure who) was kind enough to sponsor my participation in the #oneHRC House Marathon which at $50.00 USD was way outside of what I budget for these events. I can however say that throughout my year of being involved with virtual racing I’ve only heard good things about the Geek’d out Running Club so they could be worth a look at too, especially as their medals aren’t limited to one particular fandom. Also earlier this year Hogwarts Running Club aligned themselves with the Stars Hollow Running Club (any Gilmore Girls fans out there?) So they would also be worth investigating and even Disney hold a virtual running series! Disney! If you do end up doing any of the virtual races on offer let me know what you think, I’d really be interested in your thoughts! I run, therefore I am?